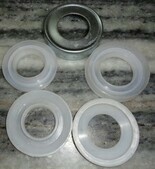 We are manufacturing Conveyor Idler labyrinth seal in 6203, 6204, 6205, 6206, 6207, 6208 , 6209 bearing sizes. Matching up with the requirements of our clients, we are involved in offering Labyrinth Seal. We are manufacturing Conveyor Idler Roller Labyrinth Seal for 6203, 6204, 6205, 6206, 6207, 6208, 6304, 6305, 6306, 6307, 6308, 6309 bearing housing sizes in HDPE & Nylon 6 Material. We are offering a vast range of Labyrinth Cover to our customers. These are developed from supreme grade raw materials and verified as per quality standards. They are strongly constructed and deliver high performance. Our team considers customers requirement and expectations in manufacturing to ensure complete customer satisfaction. 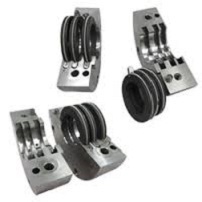 We are manufacturing Labyrinth Seals for conveyor idler roller in 6203/6204/6205/6206/6207/6306/6307 bearing sizes in Nylon 6 material.All our labyrinth seals are manufactured using quality raw material procured from reliable vendors to ensure consistency in quality. A variety of fixed and floating labyrinth seals are used on both machine side and non machine side of the bearing housing as desired by customer. The standard seals provide IP 44 protection. Higher degree of protection up to IP 55 both metallic and non metallic (insulated) can be provided on request. Moving ahead in this cutting-edge competition as a reliable firm, we are engaged in providing a wide array of Bronze Labyrinth Seal.